To the person who spoke another language the phonograph assumed a more important role. In a country with strange customs and values, where other people spoke an unfamiliar language, a phonograph could and did provide a means of emotional retreat to one’s homeland. Records of familiar songs reinforced traditional values and an immigrant’s sense of self-worth…It meant that at least one American business was soliciting his patronage by recognizing, respectfully, who he was. — Richard K. Spottswood, “Commercial Ethnic Recordings in the United States,” in Ethnic Recordings in America. Washington, DC: Library of Congress, 1982. Earlier in the blog I posted some Polish-American village music, so today I’m offering up a nice example of Ukrainian-American village music, complete with strong fiddle playing by Michal Thomas, recorded in New York City in March of 1931. Thomas, on the lead fiddle, is accompanied by a second fiddle, piano, tuba (I believe) and percussion in the form of bells. The Kolomyjka (or kolomyika) is a well-known, traditional folk dance from the western Ukraine, getting its name from the Carpathian city of Kolomyia. Like many folk dances, it can be danced in a circle, and is usually performed on special occasions, such as weddings. Columbia ruled the Ukrainian-American market in the late 1920s and early 1930s, recording approximately 430 Ukrainian records beginning in 1925. Interestingly, very few recordings were made by the major labels’ counterparts in Europe during the 1920s, making Columbia’s series especially important, musically and historically. For more Michal Thomas, you can find a track on Arhoolie’s Ukrainian Village Music CD, and a track on the out-of-print LP on New World, Song of the Shepherd: Songs of the Slavic Americans. Strong fiddle indeed! Gonna haveta ask my Ukrainian coworkers if they can do this dance one time for. (Oh and A. & I are California Bound! For a measly week, anyway – 02/14-02/22. Maybe we can meet up at beer tasting? I think one’s in the works . . .
Kolomyyka Buchatska — can be pinpointed exactly to Buchatsk region, in Ternopil oblast — not far from Kolomyia in Ivano-Frankivsk. Are you familiar with Pavlo Humaniuk? Oh, yes indeed. I have a number of Humeniuk 78s in my collection. He is fantastic. Thanks for the info on the Buchatsk region! 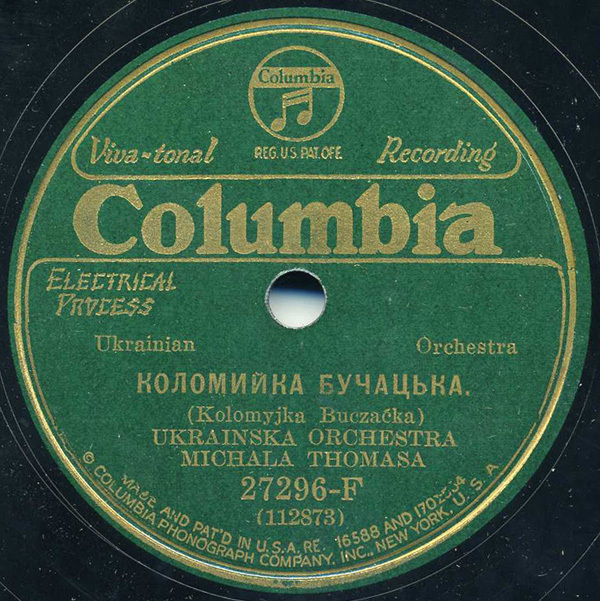 “Orkiestra Ukrainska Michala Thomasa” means “Michal Thomas’ Ukrainian Orchestra. “Michala Thomasa” is the genitive (possessive) form of Michal Thomas. Great stuff, by the way!